I have spent many waking hours trying to rank the best sandwiches. But there are so many sandwiches! 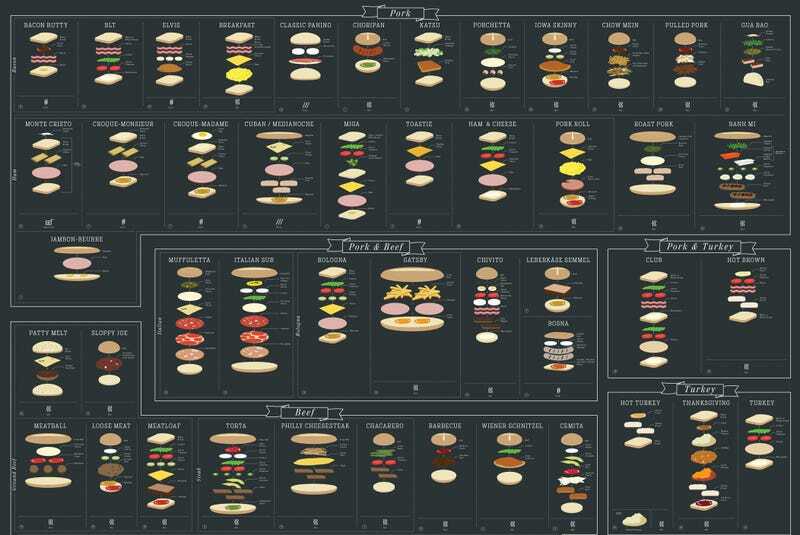 Here’s a good place for me to start: this poster shows all types of sandwiches deconstructed in delicious drawings. But there are still so many sammiches I haven’t eaten! There are nearly 90 different types of sandwiches spanning 21 different countries on the poster. The categories are loosely broken down by the meats used in the sandwich and it gets pretty thorough. My only issue with the poster by Pop Chart Lab is that the banh mi illustrated is not the most traditional banh mi (banh mi tops my sandwich rankings).